Even Mayor Rahm has a copy. In honor of the publication of Mayor 1%, Kari Lydersen's biography of you-know-who, a few hundred left-of-center types gathered at the Haymarket Pub & Brewery for a celebration. It was a party hosted by Haymarket Books, Lydersen's publisher, and the main event was a panel discussion on the state of Chicago politics in the age of Mayor Rahm. 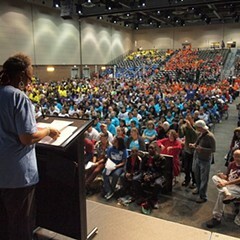 On the panel were Chicago Teachers Union organizer Brandon Johnson, Grassroots Collaborative executive director Amisha Patel, Lydersen, and yours truly. I was there, in part, because I'm probably the only man in captivity to have read both Lydersen's book and Brothers Emanuel, the recently published biography of the mayor's family, by the mayor's older brother, Ezekiel. Moreover, I'm definitely the only person to have reviewed both books and to have blurbs on their covers. On Lydersen's book, you can read me saying it's "a must-read." On Emanuel's book, you can read me saying it's "a fun read." The Lydersen blurb accurately summarizes my attitude toward her thoroughly researched and painstakingly fair account of Mayor Emanuel's career and first two years in office—as you can read for yourself. The blurb on Brothers Emanuel—from a review in the Forward—is a little trickier. Yes, I had a blast reading it—especially when Ezekiel wrote about the time little Rahm, while on a crowded bus in Israel, "nestled in the bosom of a buxom woman." 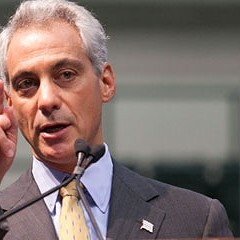 You old hound dog, Rahm! I do wish they'd gone on to quote the part that came just before the blurb, where I wrote that "I have a hard time reconciling the young Rahm, who was taught to stand up for the weak, with Mayor Emanuel, who lobbies for tax breaks for the wealthy while closing mental health clinics that serve the poor." But so it goes in bookselling. During the panel discussion, Johnson and Patel were optimistic about the fight ordinary Chicagoans have waged against the school closings, budget cuts, TIF boondoggles, and regressive tax hikes that form the cornerstone of Mayor Emanuel's administration. In contrast, I felt compelled to point out that it's hard to have faith in Chicago's voters to save themselves from Mayor Rahm, since they were the ones who elected him in the first place. For that I was relentlessly bashed as a hopeless cynic. "Did anyone ever tell you that you're a real Debbie Downer?" said Johnson. "Yeah, man, we can't take you anywhere," said Patel. "Gimme back my book!" said Lydersen. Actually, none of them said any of that—but that was sort of the gist. I tried to redeem myself by waxing nostalgic about the time when the citizens of Chicago rose up to defeat the mighty machine. And I wasn't talking about in 1983, when Harold Washington, a true giant killer, was on the ballot. 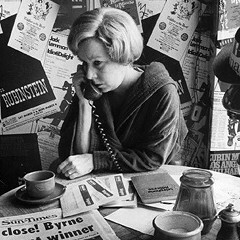 I'm talking about in 1979, when voters elected Jane Byrne as their mayor, even though she'd been written off as a flake who couldn't possibly win. After the discussion, one listener came up to tell me that "Byrne turned out to be a disappointing mayor who probably wouldn't have won without the blizzard." And they call me a Debbie Downer? In any event, everyone had a great time as a few of us stayed late to swap stories. Lydersen told about how she recently settled in to watch Dallas Buyers Club—Matthew McConaughey's latest flick—when who should walk into the movie theater but Mayor Emanuel himself! Lydersen immediately dashed out to her car to get a copy of her book, which she presented to the mayor after the movie. Which, by the way, she says is really good. 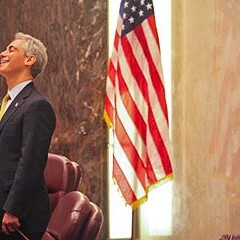 According to Lydersen, Mayor Emanuel had no comment—not even a thanks. He just took the book and walked away. I bet you anything he read it, though. 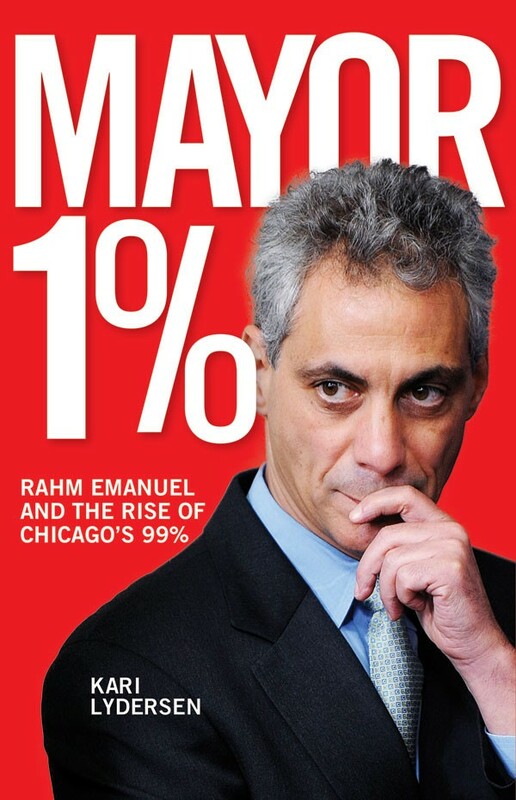 Which means there are now at least two people who have read Mayor 1% and Brothers Emanuel. Assuming, of course, that he also read his brother's book. 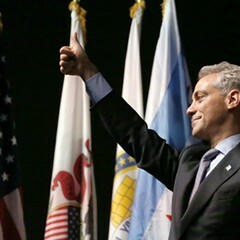 Even in Chicago, an unknown on a kamikaze mission can end up winning the mayor's office.